Andy Towle has been posting about controversy in the UK over signs advertising the traditional dish called “faggots” as a menu item (or an item not on the menu, as the case may be). Which made me remember this shot I took when I was staying in Edinburgh in 2000, while performing with The Neo-Futurists at the Fringe Festival. I happened upon this tres yummy-looking little package in a frozen food case at a small grocery store up in Leith, where the Neos had our accommodations. 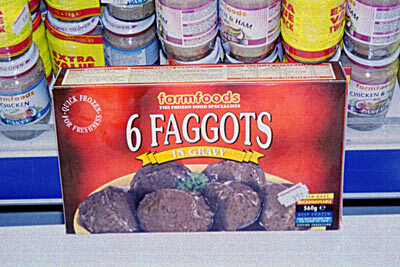 In case you can’t make out the words on the yellow banner, the box says, “6 FAGGOTS IN GRAVY”. Second reaction was to get a picture, natch. But gravy is nice, too. Nice how you managed to work both whipping and cherries into that comment!